The Wild Storm #21 Review – AiPT! The Authority get serious, Apollo charges his batteries and Miles Craven continues to unravel in the Wild Storm’s latest outing. 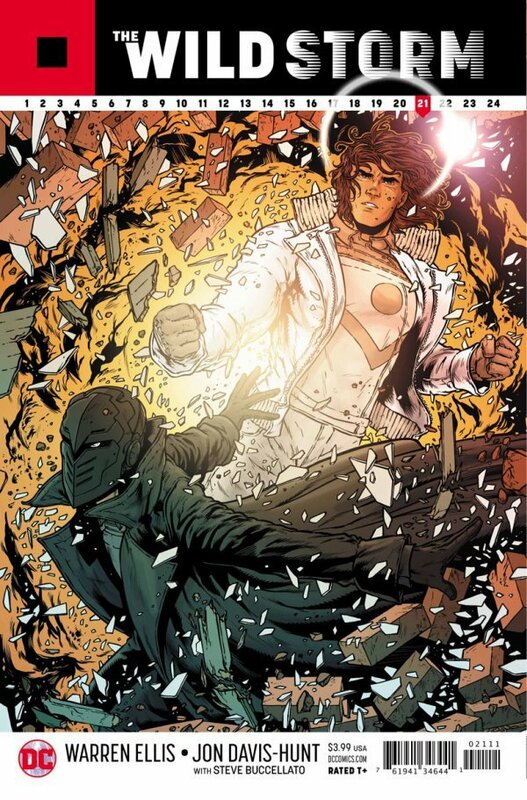 The Wild Storm boasts a fairly expansive cast, unsurprising as its circuitous tale of aliens and superspies is paying homage to a line with quite the legacy. As such, not every character can get a share of the spotlight every month. Even characters that are pretty well established and integral to the plot remain relative mysteries, with fans of the previous iterations of said characters often filling in the gaps with details from those earlier takes. That’s why it’s a delight to see issue #21 take some time to breathe life into a few of the more underserved (from a personality standpoint) cast members in a way that both keeps the plot moving and makes us understand their motivations better at the same time. Furthermore, it makes us care about the characters more than just knowing that they have slept with a more developed character. One character that finally got some much needed modus operandi is Jenny Sparks. The erstwhile Authority leader has been operating under the radar for pretty much the entirety of the series, and even revelations of her mysterious “birth” as a planetary defense system not really explaining what it is she hopes to achieve as a part of her ever-expanding crew of Shan, Ang and Jack. Her expression of remorse at her failure to live up to her role as a protector of the planet is a welcome wrinkle to her character, and he breaking down at the thought of what her failure would mean really livened up the characters for readers AND her cohorts. It also serves as a great springboard for the Authority’s role in the coming conflict. It’s great work from Ellis to shine some light on a character that has honestly been a bit cold for most of the series’ run. The bigger surprise is the growth in character of Lauren Pennington, née Fahrenheit, who has mostly served as window dressing for the more animated (and overtly megalomaniacal) Henry Bendix but emerged here as a more developed individual. Sure, she’s potentially more evil now, but seeing the pathos that brought her from the position of ladder-climbing professional to, in her own words, would-be “queen of space” makes her a more interesting villain. If nothing else, we’ll have more emotions when she gets her comeuppance than your average henchperson. I’m a big fan of mustache twirling villains, sure, but there’s something to be said about a more nuanced take on antagonists — and between Bendix and Pennington, Skywatch now clearly has both. Elsewhere, I enjoyed our quick visit with Apollo and Midnighter, both revealed now to have been part of the same Skywatch experiments that birthed Jack Hawksmoor, and the brewing conflict within the IO is potentially my favorite storyline heading into these final few chapters, even if I feel like there may not be enough time left to reach a satisfying resolution. Without looking ahead to solicitations, it sure looks like the series plans to wrap up with issue #24 — and if that’s the case, my Lost flashbacks may start to intensify. There are so many loose ends that need to be addressed in this series that it’s a little difficult to imagine Ellis and Davis-Hunt managing to address it all. Will we learn anything more about the Daemon in the coming months? What caused Lucy Blaze to go Rogue from the other Khera, and what is her relationship with Grifter? Will we EVER get any development on the character of Voodoo? Though I normally have nothing but love for the work of series artist Jon Davis-Hunt, I feel like there are a few panels this time around where the artist just isn’t quite up to his usual quality. They are few and far between, but check out the size of Jen’s hands on that panel earlier in this review, or the awkward smile of Lauren Pennington that kind of contorts her facial features beyond a reasonable measure and all but removes her upper lip. Now, you may be able to explain this away as thematic aesthetic, as her boss/burden/mentor Henry Bendix also flashes a distorting maniacal smile when he’s in the midst of his one of his spells, but given dude usually also shoots up some sort of crazy longevity formula before these moments, I think that may be a stretch. I feel the need to reiterate that these are nitpicks for a great visual storyteller, as I love what Davis-Hunt has done with this book. Still, even A students put in B+ work sometimes. Yeah, it's still really good. Developing the character of both Jenny Sparks and Lauren Pennington is a welcome sight, even this late in the series. Shoot, we even got a bit of a look into the secret life of IO Assassin Ben Santini. That all being said, I want to see this conflict get rolling, solve a few mysteries, and build to an end worthy of the world that Ellis and Davis-Hunt have built to this point. I really enjoyed learning more about Jenny Sparks and Ms. Pennington. The IO conflict continues to boil under the surface. There are a handful of panels that just miss the mark for whatever reason. Is it wise to be creating more questions this close to the end of the series?